Refugees fleeing NATO's "Free Syrian Army," not government troops. July 22, 2012 - "The Free Syrian Army ruined our lives," reports BBC in their article, "Syria crisis: Iraqis flee 'sectarian violence' in Damascus." Refugees returning to Iraq from Syria inundated a BBC reporter with accounts of why they've fled, citing sectarian violence perpetrated by the Western backed, armed, and funded so-called "Free Syrian Army" (FSA). Accounts reaffirm that indeed foreign fighters are amongst the FSA's ranks, including Iraqi sectarian extremists serving as commanders. Reports from Libya earlier this year confirmed that hundreds of Libyan fighters as well as NATO-supplied weapons and cash were pledged to the FSA by Al Qaeda's Libyan Islamic Fighting Group (LIFG) commander, Abdul Hakim Belhaj. These accounts of sectarian violence are by no means the first. Bloomberg conceded recently that "the sectarian civil war between Syria’s Sunnis and Alawites that the world had long feared has begun," the manifestation of warnings by international geopolitical analysts signaled as early as 2007. 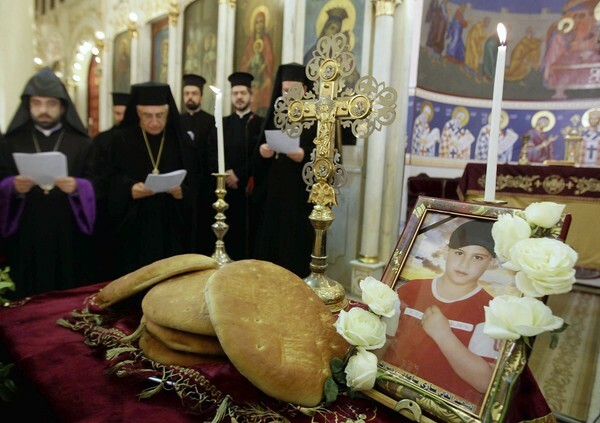 Image: Christians in Syria have been particularly hit hard by what is being described as "ethnic cleansing," not by Syrian security forces, but by NATO-backed death squads under the banner of the "Free Syrian Army." The LA Times has been quietly reporting on the tragedy of Syria's minorities at the hands of the Syrian rebels for months - and indicates that wider genocide will take place, just as it is now in Libya, should Syria's government collapse under foreign pressure. Now, demonstrably, we see exactly this feared onslaught manifesting itself in Syria, in particular against Christians as indicated in LA Times' "Church fears 'ethnic cleansing' of Christians in Homs, Syria," and more recently in USA Today's distorted, but still telling, "Christians in Syria live in uneasy alliance with Assad, Alawites." Even the massacre in Houla, seems to echo of this 2007 warning, bearing all the hallmarks of sectarian extremists like Al Qaeda.